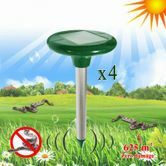 I bought the Snake Repelers to once again protect my house area and my pets from them slippery little blighters. They work well so I shall continue to use them. Summers here and so too the snakes. Bought these for my sister in law who now feels comfortable walking in the garden. She says the sound they make is not intrusive and doesnt frighten the birds she feeds. No batteries to buy as the sun supplies the power and they sit well in the garden like little green mushrooms. She loves them.